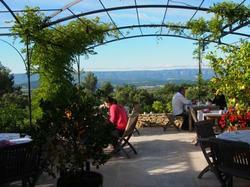 The Mas Du Loriot hotel is set in the countryside in the south of France, between Gordes and Roussillon. It offers an outdoor swimming pool in a 1-hectare garden. Guest rooms are individually decorated with tiled flooring, and most have a south-facing private terrace with views of the Luberon mountain range. All rooms are equipped with a television and a telephone. A continental breakfast is served in the rooms or on the terrace at Le Mas Du Loriot. With free private parking on site, the Mas Du Loriot hotel is accessible via the D102A road. It is situated in the Regional Park of Luberon. Please note that extra beds are charged at an additional cost of EUR 20 per person, per night and are not available in all rooms. The hotel restaurant is open on Monday, Wednesday and Friday. Guests wishing to dine in the restaurant must book before arrival. This can be done in the comments box during the reservation process. This spacious room features a large terrace with a view of the Luberon Hills. This room features a terrace with a view of the courtyard. Decorated in a romantic style, this room features a terrace with a view of the Luberon Hills. This room features a terrace and views of the courtyard.